Come join us on June 14th in the Bear Gallery at 7:00 PM where Marianne Schlegelmilch and Jim Madonna will be reading from their works. Marianne is the author of the mystery “Feather” series, including: Feather from a Stranger, Two Tickets and a Feather, Driftfeather on the Alaska Seas, and her most recent work, Feather for Hoonah Joe. 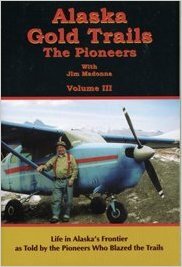 Jim is retired professor of Mining Extension at the University of Alaska Fairbanks and author of the 3 volume Alaska Gold Trails series. Marianne Schlegelmilch is the daughter of a newspaperwoman. Perhaps that is where she inherited her propensity for writing—although she would be the first to admit that her mother would be appalled at her current struggles with both spelling and grammar. Whatever the case, Marianne has written her entire life—even publishing her own neighborhood newspaper at the age of ten by using rubber stamps made of individual letters. Perhaps that gives you a good idea of just how long ago her writing career began. No longer working full time in nursing, today she writes books—eight of them as of this posting—all Alaska fiction, some for children and others for all age groups. She has three times donated her work to organizations to try to increase awareness. She also contributes to the quarterly, Alaska Women Speak, and to local newspapers just for fun. Marianne is a stubborn avoider of writing groups and organizations, choosing instead to express her own unique style of writing, which she describes as her chosen art form. She has always considered herself an artist in that she feels that expression from within is the true form of original art. In her spare time, she enjoys life with Bill, her husband of 44 years, and their young Afghan Hound, Chauncey, whom she credits with generating a welcome ten-pound weight loss and a renewed appreciation for finding exuberance in life. As a matter of fact, finding the goodness in life has become a recurring theme in Marianne’s books, and she is well known for including vivid nature scenes in her writing. Although she is inspired by life in all of Alaska, she describes her time living in Sitka as the period that most influences her writing today—that, and her work as a nurse. Marianne says that she will always write as long as she is able. She loves writing fiction and has been told by one of her Canadian readers that she can “bring a tear to a glass eye.” She loves the challenge of writing mysteries and strives to balance adventure, suspense, and excitement with the wonder of the human spirit. She appreciates feedback from her readers and is especially heartened by all of the feedback that encourages her to continue doing what she does in bringing her books to her public. “It doesn’t get any better than knowing that others appreciate you for doing what you love to do,” she says. “People often ask me about the Feather series,” Marianne Schlegelmilch says, as if she is completely baffled by the interest in the focal point of her mystery stories. She goes on to explain that when she decided that writing mysteries might be fun, the feather seemed like a logical focal point around which she could weave her stories, and so she began with the first book in the series, Feather from a Stranger. Next came Two Tickets and a Feather, Driftfeather on the Alaska Seas, and now, Feather for Hoonah Joe. Certainly Marianne’s years as a critical care nurse have been a strong influence on her personal observations of human nature, but so, too, has her own journey. From a sheltered life in a Midwestern town to the exciting cross-country travels that she credits with forming her into the person she is today, Marianne’s writing displays a deep appreciation for nature, people, animals, and for life itself. “My writing is the perfect culmination to a long career, a long life, and a long marriage,” she says. 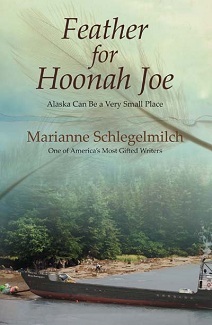 “It is as if I am taking a paintbrush and creating a master painting of the human condition from the perspective of my personal observations.” With the backdrop of Alaska to her stories, and plenty of long Alaskan winters during which to write, Marianne Schlegelmilch has emerged as one of America’s most gifted writers. If you haven’t yet discovered her work, chances are that you will be discovering it soon. Jim Madonna is a retired professor of Mining Extension at the University of Alaska Fairbanks. Between 1987 and 1989 he hosted a weekly one-hour radio talk show featuring Alaskan pioneers who shared their frontier adventures. Fans of the program urged Jim to present the content of the interviews in published form, and subsequently submitted them in a three-volume Alaska Gold Trails set. The pioneers are the stars telling their stories and showing Alaskans how this state was settled. Madonna introduces each pioneer, giving a hint of what the reader can expect. The pioneers describe their adventures and the obstacles they faced. Jim currently is proprietor of Alaskan Prospector a shop on College Road selling metal detectors, pans, sluice boxes, picks and just about anything else to amateur and small-scale miners and rock hounds looking for gold and gems in the Alaska wilderness.